Where do I use my Bad Rhino voucher code? Choose a code you wish to use from NetVoucherCodes. Go to the Bad rhino website and fill up your basket with Men’s fashion products. Once finished, view your basket by selecting the ‘My Bag’ icon. Enter your code into the box labelled ‘Got a Voucher Code?’. Select ‘Apply’ then ‘Go To Checkout’ to complete your order. Find clothing specialised for big and tall men in sizes L - 8XL, and refresh your wardrobe for all seasons of the year. 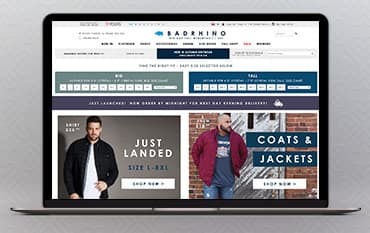 There's a huge range of clothing at Bad Rhino including jeans in different styles like bootcut, tapered, comfort and straight, polos, coats and jackets, knitwear like chunky jumpers, trousers, chinos and shirts. You can also browse the clothing in the Tall Shop which houses garments in sizes L-8XL and you can shop via brands such as Henleys, Regatta, Ecko Unltd, D555 and much, much more. Check out the sale at Bad Rhino and discover great discounts on clothing, accessories and footwear. You can shop via size and refine your search by style, whether that be hoodies and sweatshirts, t-shirts, underwear, coats and jackets, t-shirts, vests or cardigans. You can also choose by fit whether that be regular or tall. There's also different patterns and necklines available as well as plain, printed and patterned, crew neck and v-neck. You can also shop via promotion so you can choose how much discount you want and the price scale you want to work with. NetVoucherCodes have tonnes of great voucher codes to help you save money on your online shopping at Bad Rhino. When shopping for large men's clothing at Bad Rhino, check out our discount codes and grab a bargain on your order. Simply browse our Bad Rhino deals page and choose from all the biggest discounts and latest promotions available including sales, offers and deals, our promotions will take you straight to the deals section on the Bad Rhino website, so there's no need to spend time looking around for the best deals, just come directly to us. With our help, all you thrifty shoppers out there could find yourself saving a fortune, no matter what you buy. If you wish to make a return, you can do so free of charge at your local store, an ASDA store, using CollectPlus or the Post Office. Items must be unworn and returned within 21 days of receipt. Get more Returns details at the Bad Rhino Returns & Refunds page. Bad Rhino provide high-quality Mens Clothing at affordable prices. The sister brand to Yours Clothing, they specialise in clothes size XL and above, they offer a wide range of fashionable clothing for today's man. They also stock a wide range of clothing for the taller man, with long length jeans and larger shoe sizes readily available. Take advantage of one of the money saving deals or Bad Rhino discount codes listed here, to get a discount on your next clothing order.